into a successful business of the future. 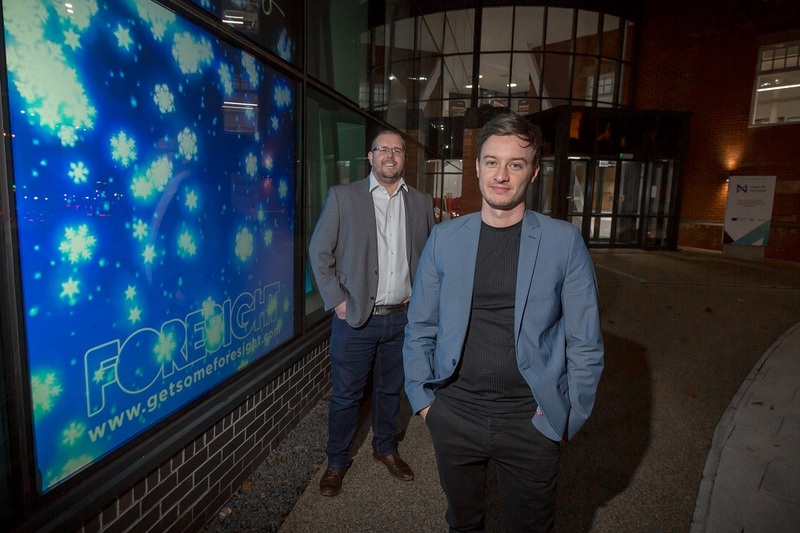 Barry Braley and Lee Daymond have now brought their creative elearning company Foresight to offices at the University’s Hope Street Xchange building. And you won’t be able to miss the lads after they decided to utilise their new city centre location with a special window display. The digital projection screen in the new offices looks out onto St Michael’s Way and is helping bring some vibrancy to the area. Likewise, Barry and Lee are bringing their considerable digital training experience to the city centre by choosing to locate here. Barry, 36, said: “We just loved the spot in Hope Street Xchange and there’s a lot of new businesses starting up here so it’s good to be able to share experiences. “When we were looking for premises, we did look down towards the East End of the city but we liked the idea of being more centrally located. Foresight works with businesses to create high quality, innovative experience in animation, video and curriculum development to help engage employees. They also offer to develop online learning environments to support learners and reduce training costs for companies. Lee, 31, said: “Our digital creative skills help businesses to raise their profile and impact across social and web platforms.